The Director-General, National Youth Service Corps (NYSC), Maj.-Gen. Suleiman Kazaure, on Thursday, warned corps members in Taraba against going for swimming and other forms of social events without approval by the authorities. “No swimming and no travelling without due permission from the authorities so that you don’t get into trouble’’, he said. 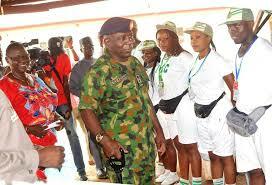 Yaakugh also commended the corps members for being of good behaviour at the orientation camp.